[Suleiman] Franjieh's ties to the Assad family date to his childhood when his grandfather, the late President Suleiman Franjieh, took him on trips to Damascus to visit his friend, the late President Hafez al-Assad. Franjieh used to hunt with Bashar al-Assad's older brother, Basil, who died in a 1994 car crash. He was orphaned in 1978 when a Christian militia attacked his family home in northern Lebanon, killing his father, mother and sister. [Samir] Geagea has been accused of responsibility for that civil war time attack, though he has denied participating. Officials at the Russian defense ministry could not immediately be reached for comment. Syrians in rebel-held areas of northwestern Syria near the Turkish frontier have reported intensified air strikes in the days since Turkey downed a Russian warplane near the border. Since the plane was not shot down by Syrian rebels, there's no direct military rationale to intensify air strikes after the shoot-down. It could of course be revenge, which would be a war crime. My dad told me that any job where you can legally carry a gun will occasionally draw the wrong type of person. Imagine scaling up those odds, via literalist interpretations of 18th century gun laws, to the entire population. The Islamic State, also known as ISIS, ISIL or Daesh, has for the first time engaged in what appears to be a centrally planned campaign of terrorist attacks aimed at inflicting huge civilian casualties on distant territory, forcing many counterterrorism officials in the United States and in Europe to recalibrate their assessment of the group. “They have crossed some kind of Rubicon,” said William McCants, a scholar at the Brookings Institution and author of “The ISIS Apocalypse.” “They have definitely shifted in their thinking about targeting their enemies.” When the Islamic State’s Egyptian arm claimed responsibility for blowing up a Russian charter plane over Sinai two weeks ago, some analysts wondered if the group’s so-called Sinai Province of the Islamic State had acted on its own and leapt out in front, even at the cost of risking a Russian military backlash on the parent group in Syria and Iraq. But the attacks last week in Paris and Beirut, which the Islamic State also said it carried out, appear to have settled that question and convinced even skeptics that the central leadership was calling the shots. The photo is US Senators John McCain and Lindsey Graham sitting in the office of Iraqi Prime Minister Haider al-Abadi. McCain might have sat in the same couch that the head of the Iranian-influenced Badr Organization (who also heads the Hashid Shaabi militia consortium) was sitting in a couple of days before. McCain has been going to Iraq since 2003; here's a chronicle of visits and associated statements during 2003-2008. It's always saying that the struggle most go on, and more support from the US must be forthcoming. The current crop of Republican presidential candidates will soon be looking to "burnish their foreign policy credentials" with overseas visits. The McCain-Graham broken record on Iraq is a reminder that foreign travel within a VIP bubble and an even more constraining VSP narrative doesn't make for any better policy. The main basis of the global coalition’s actions against ISIL in Syria is the collective self-defence of Iraq. Iraq has a legitimate Government—one that we support and help. There is a solid basis of evidence on which to conclude, first, that there is a direct link between the presence and activities of ISIL in Syria and its ongoing attack on Iraq, and secondly, that the Assad regime is unwilling and/or unable to take action necessary to prevent ISIL’s continuing attack on Iraq, or indeed attacks on us. He does go on to present an ancillary self-defence rationale, but that's limited by proportionality -- a small number of plots against European countries don't justify a large scale assault. Responsibility to Protect has ended up being seen as a dodgy doctrine, because the outcomes have been so meagre, but is a more traditional legal doctrine based on defending a weak and perhaps failing state from external non-state attack leading to any better decisions? Since the attacks, Americans have recalled their own visits to Paris -- visiting the Eiffel Tower, or walking along the Seine. We know these places. They’re part of our memories, woven into the fabric of our lives and our culture. His assumption that Americans relate to the Paris attacks because they've been there themselves may resonate with a lot of people, including the ones of readers of this blog, but in a country where many people don't cross a border much, if ever, it's a revealing assumption, and one that Republican primary candidates could exploit, if they were paying attention. I spent an evening with [Deputy Crown Prince] Mohammed bin Salman at his office, and he wore me out. With staccato energy bursts, he laid out in detail his plans. His main projects are an online government dashboard that will transparently display the goals of each ministry, with monthly K.P.I.s — key performance indicators — for which each minister will be held accountable. His idea is to get the whole country engaged in government performance. Talk about reform — in Dubai, the government has set a strategy for 2021, and each of the 46 ministries and regulatory agencies has three-year Key Performance Indicators, or K.P.I.’s, they have to fulfill to get there, ranging from improving the success of Dubai 15-year-olds in global science, math and reading exams to making it even easier to start a new business. All 3,600 K.P.I.’s are loaded on an iPad dashboard that the ruler, Sheikh Mohammed bin Rashid, follows each week. So I took the opportunity of a dinner with Saudi Arabia's crown prince, and de facto ruler, Abdullah bin Abdul Aziz al-Saud, to try out the idea of this Arab League proposal. I knew that Jordan, Morocco and some key Arab League officials had been talking about this idea in private but had not dared to broach it publicly until one of the ''big boys'' -- Saudi Arabia or Egypt -- took the lead. After I laid out this idea, the crown prince looked at me with mock astonishment and said, ''Have you broken into my desk?'' ''No,'' I said, wondering what he was talking about. ''The reason I ask is that this is exactly the idea I had in mind -- full withdrawal from all the occupied territories, in accord with U.N. resolutions, including in Jerusalem, for full normalization of relations,'' he said. ''I have drafted a speech along those lines. My thinking was to deliver it before the Arab summit and try to mobilize the entire Arab world behind it. The speech is written, and it is in my desk. But I changed my mind about delivering it when Sharon took the violence, and the oppression, to an unprecedented level. ''But I tell you,'' the crown prince added, ''if I were to pick up the phone now and ask someone to read you the speech, you will find it virtually identical to what you are talking about." ALGIERS (Reuters) - At least 18 people died and 37 others were injured when a fire broke out at a camp for African refugees in southern Algeria on Tuesday, Algerian official media reported, citing civil protection services. Mr Jeffrey M. Donaldson (Lagan Valley) (DUP): With support for the Union in Northern Ireland growing ever stronger, may I help to assuage the concerns of the right hon. Member for Moray (Angus Robertson, SNP) by saying that we have lots of loughs and lots of ports, and that if the Government ever need a new home for Trident [nuclear submarines], Ulster is there? The Prime Minister: I know that the right hon. Member for Lagan Valley (Mr Donaldson) and I are united as one in hoping it never comes to that. It was nice of Mr Donaldson to offer various parts of Ireland, including Donegal, as a home for potential evictees from Scotland. Egyptian border forces shot dead five Sudanese migrants trying to cross from Egypt's turbulent North Sinai region into Israel on Monday, the military said in a statement. "Law enforcement tasked with protecting the border spotted at dawn today a group of Africans trying to sneak though the international border in cooperation with criminal elements involved in illegal immigration," the military said. The plight of migrants within Africa has been lost in all the focus on the European Union migration crisis, as has the practices of countries along their route. They're a bunch of killers with good social media. Some "JV" style cleanup might be needed after that remark. As we've noted in earlier posts, the emerging bimodal view on what must be done about ISIS is either the Krugman-Yglesias-Klein consensus that any kind of major response is a trap, versus the off-the-record Pentagon-Russia-Israel triangulation of brutal but ultimately effective urban war: Hama, Grozny, Gaza, and perhaps next, Raqqa. But is there somewhere in between? In the Bamako Radisson Blu siege on Friday, the Malian special forces faced difficult odds. At least two, and probably several more gunmen had gotten inside a busy hotel, and would kill as many people as they could. They killed 19, but 10 times that number were saved. Three years ago, the In Amenas siege in southern Algeria took place, which is connected in terms of perpetrators to Bamako. 39 hostages were killed, but Algerian forces freed 15 times that number of hostages, and killed a large number of the Al Qaeda-linked attackers. Against Boko Haram, the most effective national forces have been those of Chad, but their methods require the occasional wince. There are some common factors. First, French-style train and equip seems to work a lot better than its American version, not least because the French stick around indefinitely to see what's happening. Second, these forces accept casualties -- themselves and hostages -- as a price of ending a crisis and sending a signal of their intent (a cliche normally reserved in western countries for sports commentary). Of course, these tactics come with costs, and reflect the circumscribed politics of the countries. But from their perspective -- and arguably from the "western" perspective, in terms of what it saves "us" from -- it works. And by the way, it was the Moroccan intelligence service who knew where in Europe the most wanted man in Europe was. And now he's dead. The solution to a problem that severely afflicts Africa might lie in ... Africa! Russia is demanding that Lebanon clear its airspace for Russian military exercises. Where oh where could the Russians have picked up the notion that Lebanese sovereignty doesn't count for much compared to the needs of Syria? Above: the blast scene after the assassination -- most likely ordered by Bashar al-Assad -- of Rafik Hariri. Vladimir Putin held a a video conference meeting today at the Kremlin with the heads of the various military sectors involved in his pro-Assad operation in Syria. Among the details, clearly intended for public consumption, they're using: Engels Air Base, named after Marx's intellectual companion Friedrich Engels; Mozdok Air Base, which for a time over the last 20 years looked like it was being downgraded not least because of proximity to Chechen rebel areas; and Olenya Air Base near the Arctic Circle, which at one time would have the forward base for a strategic bomber attack on North America. Also, one of the missile ships being used from the Caspian is named Dagestan (another restless Islamic territory and original home of the Boston marathon bombers). Russia a place where history is everywhere. Background: recent events involving student protests at the University of Missouri. Missouri and Paris have something important in common. Both represent the inability of primary social institutions to defend themselves. It's quite a leap to look at a situation involving spree killers and think that the right comparison to American educational institutions involves the handing of student demands. The less this election hinges on income inequality and the more it focuses on ISIS, the likelier voters are to turn toward the GOP. "Nothing about what these assholes are trying to do is going to work" Oliver said. "France is going to endure. And I'll tell you why: If you're in a war of culture and lifestyle with France, good f*cking luck." That logic depends on convincing most people that the French culture and lifestyle which they can see up close or on television is actually attainable. If you think you're always going to be on the outside looking in, and mix that emotion with the Islamist cocktail, a different set of options can persist for a long time. At his Turkey news conference today, President Obama set out a sensible and realistic process for understanding whether terrorist incidents could have been anticipated. One wonders what would happen if it was applied to 9/11! PRESIDENT OBAMA: Jim, every day we have threat streams coming through the intelligence transit. And as I said, every several weeks we sit down with all my national security, intelligence, and military teams to discuss various threat streams that may be generated. And the concerns about potential ISIL attacks in the West have been there for over a year now, and they come through periodically. There were no specific mentions of this particular attack that would give us a sense of something that we need -- that we could provide French authorities, for example, or act on ourselves. But typically the way the intelligence works is there will be a threat stream that is from one source, how reliable is that source; perhaps some signal intelligence gets picked up, it’s evaluated. Some of it is extraordinarily vague and unspecific, and there’s no clear timetable. Some of it may be more specific, and then folks chase down that threat to see what happens. I am not aware of anything that was specific in the sense -- that would have given a premonition about a particular action in Paris that would allow for law enforcement or military actions to disrupt it. Recall also that the Russian plane bombing might have been discussed ahead of time as something big involving aviation. Apparently there's social media "outrage" that Saudi Arabia ignores terrorist atrocities in western countries. Here's Kingdom Tower in Riyadh displaying the French tricolour within the constraints of its distinctive architecture. And in case you're wondering about the title of the post. RHODES: Well, we'll have to be nimble, George. And that means looking at ISIL's efforts to expand. It should be noted that we took that strike against the leader of ISIL in Libya precisely because we were concerned about their efforts to set up a stronghold in Libya similar to what they've been able to do in Iraq and Syria. So we are going to be vigilant. And we're going to have a basic principle here that there cannot be a safe haven for a terrorist organization like ISIL that terrorizes the population around it and that seeks to project power and conduct attacks in the capitals of close friends and allies like France. Ansar Beit al-Maqdis, operating out of the Sinai peninsula, meets that criterion. Does that mean that the US is now all-in with Egyptian President al-Sisi in the military crackdown in Sinai? Zack Beauchamp: Of those explanations that you've offered, which one do you think is the most plausible? Will McCants: I guess if this were just about an attack in Europe, you might say that it is in reprisal for the attacks being carried out in Syria and Iraq. I don't see this as necessarily part of the propaganda effort or the war with al-Qaeda, because they've already succeeded in attracting far, far more recruits. Given the target of a major enemy in Europe, in light of attacks on Russian civilians and an Iranian ally in Lebanon, it seems to me that this has to do with the war to expand its territory in Syria and Iraq. It is putting its major adversaries on notice that if they continue to impede its state building that they will pay a price. If its role in bringing down the plane is confirmed, the Sinai Province may have even momentarily surprised and surpassed its vicious parent, and, some analysts said, risked a broad backlash against the Islamic State itself ... The parent group, based in Raqqa, Syria, has much to lose by approving or even embracing the apparent bombing, he [William McCants] argued. Although supporters of the Islamic State are calling the jet’s crash retribution against Russia for its intervention in Syria to prop up President Bashar al-Assad, Mr. McCants noted that the Russians had mostly attacked Western-backed rebel groups that were foes of the Islamic State. “Russia has been hitting their enemies for them,” Mr. McCants argued. “I can’t imagine the guys in Raqqa want Russia to go all in against them.” ... But some analysts now wonder if the Egyptian offshoot has taken the Islamic State’s ideology of violence against its enemies even further than its leaders envisioned, multiplying its powerful enemies. “You can’t just say ‘let a thousand bloody flowers bloom’ without some of the blood splattering back at you,” Mr. McCants said. Compare the expert and the associated interpretations in the two extracts. “They have crossed some kind of Rubicon,” said William McCants, a scholar at the Brookings Institution and author of “The ISIS Apocalypse.” “They have definitely shifted in their thinking about targeting their enemies.” When the Islamic State’s Egyptian arm claimed responsibility for blowing up a Russian charter plane over Sinai two weeks ago, some analysts wondered if the group’s so-called Sinai Province of the Islamic State had acted on its own and leapt out in front, even at the cost of risking a Russian military backlash on the parent group in Syria and Iraq. No quote from any of those latter analysts is provided -- they must have been difficult to locate! ISIL and other terrorist groups in Syria are a threat not only to Iraq, but also to many other countries, including the United States and our partners in the region and beyond. States must be able to defend themselves, in accordance with the inherent right of individual and collective self-defense, as reflected in Article 51 if the UN Charter, when, as is the case here, the government of the State where the threat is located is unwilling or unable to prevent the use of its territory for such attacks. The Syrian regime has shown that it cannot and will not confront these safe-havens effectively itself. Accordingly, the United States has initiated necessary and proportionate military actions in Syria in order to eliminate the ongoing ISIL threat to Iraq, including by protecting Iraqi citizens from further attacks and by enabling Iraqi forces to regain control of Iraq’s borders. In addition, the United States has initiated military actions Syria against al-Qaida elements in Syria known as the Khorasan Group to address terrorist threats that they pose to the United States and our partners and allies. Since (1) the Pentagon recently announced that it had killed the head of the "Khorasan Group" (a name they made up to find a reason to attack al-Nusra Front), (2) Syria has since asked Russia for help in attacking ISIS, and (3) ISIS has shown that it can attack beyond its region well over a year after the original military action began, the entire international law justification for the operations now rests on the dubious benchmark of Iraq at some point having full control of its territory. By narrowing the scope of the claimed success of those operations to their impact on Syria and Iraq, Obama was essentially conceding that a key rationale for the operation, and the one most closely linked to US national security, is invalid. "There is no justification for terrorist acts and no justification for us not (to do) much more to defeat ISIS, al-Nusrah and the like," [Russian foreign minister Sergei] Lavrov told reporters ahead of a meeting with his U.S. counterpart John Kerry and U.N. special envoy Steffan de Mistura. Al-Nusra is not known to be implicated in any of the recent terrorist attacks outside Syria, and his addition of "and the like," based on current Russian military operations in Syria, includes all groups opposed to Bashar al-Assad. Are the G20 leaders really proposing to sit with Vladimir Putin in Turkey this weekend and NOT consider the possibility of a link between his intervention in Syria and scaled up regional terrorism: Sharm Al-Sheikh, Beirut, Amman, and Paris? The wretched media trend of naming winter storms has now gone official with the confirmation of this year's first named North Atlantic winter storm by the UK and Irish Met Offices. It will be Abigail, which has the cliche has it, means Bringer Of Joy. Bring on Clodagh! Above, Iraqi PM Haider al-Abadi today meeting with Moqtada al-Sadr. The photo provides a moment to reflect on the degree to which Moqtada al-Sadr was the favourite "bad guy" early in the insurgency following the US invasion in 2003 -- an obsession that made the Bush administration even slower to grasp the nature of the Sunni resentment bubbling underneath. The August 14, 2013, clearing of Muslim Brotherhood protests in Egypt resulted in attacks by Muslim Brotherhood supporters targeting the Coptic Christian community. That "clearing" of protests is generally known as the Rabaa massacre, in which between 700 and 1000 people were killed. It remains the largest unaccounted-for killing in Egypt's modern history, and among the single largest killing of protestors anywhere in the world. Intelligence officials said that they had intercepted communications from militants based in Sinai before and after the crash but that the intercepts were inconclusive. In the days leading up to the crash, American spies intercepted an electronic communication discussing “something big in the area” related to aviation, a senior American official said on Friday. But it was a single intercept that conveyed no specific time or place — the kind of militant chatter the analysts see all the time, the official said. Sadly that portrayal of how information was being dealt with is proof that we've "moved on" from 9/11. Another echo of that era is the apparent lack of awareness of the prolonged deterioration in security in Sinai and of the risks associated with the Egyptian military's heavy-handed response. That's just one reason why any wistful talk of a forceful Russian response -- which would just be the existing Egyptian response with even more weapons -- is headed for disappointment. If the information trickle around the Russian passenger plane crash in Egypt is not generating some serious questions for the media and security officials, it should. The "respectable" media has been locked into the "here's what we know" mentality. This forbids the type of probabilistic judgment involved in noting it was a Russian flight originating in a region where ISIS has a potent affiliate while Russia is engaged in a war of choice in the Middle East -- hence a terrorist attack had to be one of the possibilities. Meanwhile, intelligence agencies had apparently come to that conclusion from the start, but for whatever reason, decided to wait a few days until saying so even with the associated risk to flights still present. in the past, principally focused on taking and holding territory in the Middle East rather than executing dramatic transnational terrorist attacks. in fact, Ansar Beit al-Maqdis had conducted several brazen attacks in Israel. It doesn't help that Russia and Egypt both have extraordinary incentives to obscure the causes of the crash. Prominent conservative opinion writers Daniel Pipes and Michael Rubin are so shocked that a President could steer an election result in his favor in an atmosphere of war and terrorism, they think the election result can only have been rigged! Turkey 2015, not USA 2004. 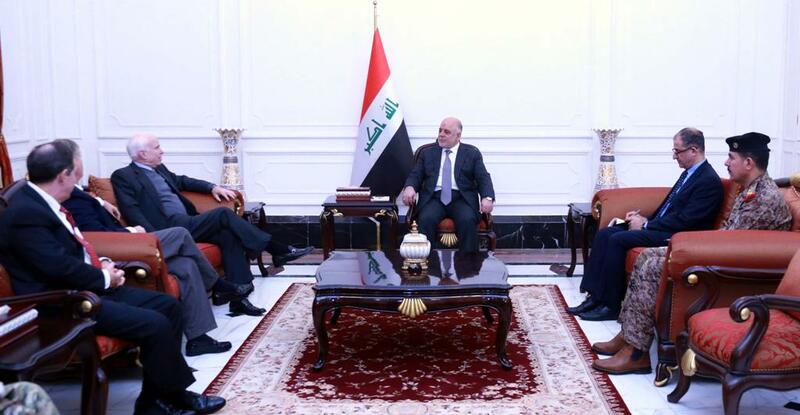 Well, it is a pleasure to be with Prime Minister Abadi and his delegation. Obviously, the United States has made an enormous commitment and investment in Iraq, and we’re fortunate to have a reliable partner in Prime Minister Abadi ... And in all of these discussions, what I found is that Prime Minister Abadi is very much committed to effective, inclusive governance. The good news is that Iraqi PM Abadi has indeed succeeded in uniting the entire Iraqi parliament in response to his agenda. Iraq's parliament voted unanimously on Monday to bar the government from passing important reforms without its approval in an effort to curb Prime Minister Haider al-Abadi amid discontent over his leadership style, lawmakers said. The chamber acted after Abadi unilaterally enacted reforms in August that it deemed a violation of the constitution including his dismissal of the vice presidents and deputy prime ministers and cuts to salaries of government employees. Given what looks like perpetual disarray in the White House on Middle East policy, there may be staffers there wondering if that other guy Maliki is still available. In an exclusive interview with Al-Monitor, CHP Deputy Chairman Erdogan Toprak, who coordinates the party’s electoral campaign, said the CHP had recruited Benenson Strategy Group (BSG), the US firm credited for President Barack Obama’s winning electoral strategies. Hillary Clinton has also recruited BSG to work for her 2016 presidential bid. Why do political parties outside the USA continually fall for the illusion that American pollsters, even if they have some kind of special sauce that works wonders in US elections, will be able to do anything like that overseas? Is the whole thing really just backdoor lobbying of American politicians? Because there's not much evidence that electorally, it's effective.